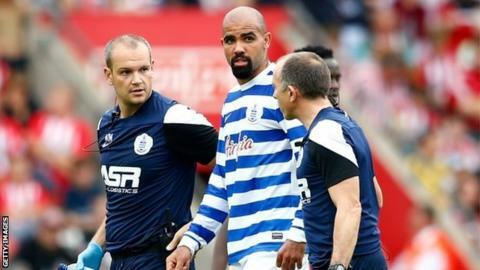 QPR manager Harry Redknapp has called on the football authorities to consider following their rugby counterparts by allowing temporary substitutions to improve the treatment of concussion. Redknapp was frustrated after medics withdrew Sandro just 11 minutes into Saturday's 2-1 defeat at Southampton following a heavy blow to his head. According to Redknapp, the midfielder seemed to have recovered by half-time. Redknapp said short-term replacements was an idea "worth looking at". However, brain injury association Headway has warned that such a move could be dangerous. Under Premier League rules introduced this season, the final say over whether players who suffer head injuries are substituted now rests with club doctors. A player suffering a head injury must now leave the pitch. Team managers or coaching staff will no longer decide if a player continues to play and the final decision will be with the club doctor. Home teams in the Premier League must now have a third "tunnel" doctor on match-days to support the work of the doctors for both sides. The "tunnel" doctor will serve as an extra pair of eyes to spot potential concussions and watch TV replays to see the severity of incidents. The FA, in conjunction with the Football League, PFA and LMA, is to launch a campaign aimed at making players and managers aware of the dangers of head injuries. The Premier League is to employ its own doctor to conduct research and liaise with all 20 club doctors in the league on key medical matters. All Premier League players are to undergo baseline neurological assessments as part of their annual medical check-up to help doctors measure their recovery time if they suffer a concussion. Last season, Tottenham received widespread criticism after their goalkeeper Hugo Lloris returned to action despite being knocked unconscious. The former Spurs boss added: "You couldn't wait 10 or 15 minutes with 10 men; you couldn't give medics that amount of time to look at a player. "But it doesn't sound the worst idea for a temporary replacement, so that the doctors could have a longer look. "Medical people can't take a chance and if someone is very bad you cannot expect them to carry on because if something went wrong we would all be very sorry. "But at half-time there didn't seem to be a lot wrong with Sandro to me. He was fine in the changing rooms, he didn't look too bad at all but obviously the doctors have got to err on the side of caution." Luke Griggs, from Headway, said temporary substitutions should not be introduced. "Head injuries are not like other sports injuries," he explained. "Concussion is an evolving injury and the symptoms may take time to manifest. "Damage such as bleeding or swelling to the brain may not be immediately obvious, while continuing to play after suffering a concussion can make you more susceptible to further, more damaging, injury. "The danger with allowing temporary substitutions is that the period of assessment for a player is very limited. In addition, this assessment is conducted in a non-clinical environment. "Until we have a more robust, scientifically-accurate means of quickly assessing concussion during games, the safety-first approach must be taken."